EdgeCAM Solid Machinist loads native SolidWorks parts and assemblies without translation, enabling EdgeCAM to utilise more of the intelligence within the model to generate efficient machining strategies. With EdgeCAM Solid Machiniist for Solifworks, individual parts, SolidWorks configurations and assemblies are loaded directly into EdgeCAM. 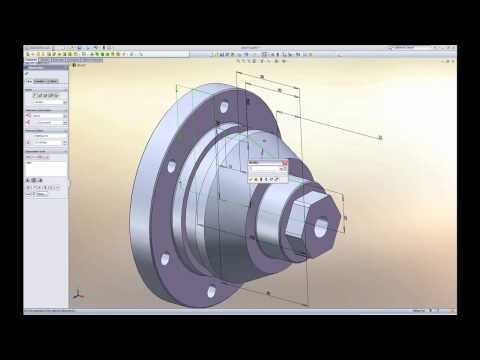 The associative link between EdgeCAM Solid Machinist and SolidWorks means that even late changes to the model will not affect the manufacturing lead times. EdgeCAM Solid Machinist detects when the SoldWorks model has changed and notifies the user. The user has the option to update the model to the modified version and automatically identify features that are new or have been changed or deleted. The EdgeCAM toolpaths are generated automatically and new NC code is produced. Solid models are machined using innovative, reliable and gouge free roughing and finishing cycles. Intelligent approach strategies provide a high-quality surface finish while optimising machining times and maximising tool life. In addition EdgeCAM toolpaths are optimised for high speed machining. Automating tool selection reduces machining time and production costs. EdgeCAM Tool Selector provides users with the optimum tool selection for feature machining. Cycle times are optimised in line with currently available tooling, giving maximum machining efficiency.